Pride’s Jazzy Elite HD Front Wheel Drive power wheelchair features blue or red color-through shrouds to protect the shrouds against nicks and scratches. 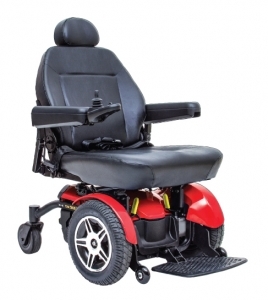 It is a heavy duty power chair with 14″ flat-free drive wheels that can handle most terrains. The Jazzy Elite HD has many seat styles and sizes to choose from. High-back options include durable, black vinyl upholstery and a comfy headrest. Seats are depth adjustable on the standard seats, while the Solid Pan Seat option gives you a solid surface for seat cushion. 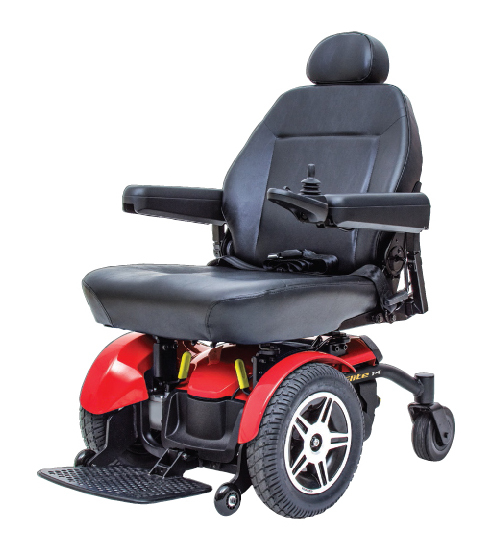 Jazzy Elite HD offers heavy-duty construction, a 450 pound weight capacity, and excellent performance in a stylish, highly maneuverable power wheelchair. 42.5″ Unit Weight: 185 lbs.